They think it’s an audio unit that adds plenty of unnecessary bass and creates a boomy and annoying sound. On a point, they aren’t wrong, considering the fact that a $50 2.1 channel system comes with an average quality subwoofer. However when you’re shelling out serious money; close to $500, you’re ought to get the best quality subwoofer available in the market right now. Hence why, I’ve listed the 5 Incredibly Awesome and Best Subwoofer under $500 that you can buy right now and add to your audio collection. The 5 Subwoofers mentioned below are currently the best home theatre subwoofer under $500 that are surely bang for your buck, and will only elevate the audio quality of your sound system. Just find the perfect space to place the subwoofer in your house and you’re good to go. Technically, one of the cheapest subwoofer in our list and probably the best subwoofer under $400 pricelist, the Pioneer SW-10 [check review] is a bass machine meant for masses. Featuring a run-of-the-mill design, performance is what mattered to the sound engineers at Pioneer, while designing this mean subwoofer. With a max of 400W total power output, I dare anyone to tell that this subwoofer isn’t deep enough to fill your room. The 10-inch down firing woofer makes sure it’s big enough to shake your room and loud enough for your neighbors to come complaining about the earthquake next door. 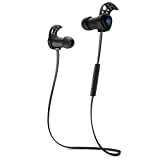 …the company went step further and launched the SW-10 with improved specs and better built quality along with durability. It features a powerful 200W internal amplifier, which inturn helps to control bass at high volume and with a total harmonic distortion of less than 1%, you are sure to enjoy music and movies without much distortion. To make the best use of Pioneer SW-10, you can pair it alongside Pioneer’s SP-BS22-LR Bookshelf Speakers to enjoy a thumping and booming sound. Weighing at around 30 lbs, the subwoofer is quite heavy and hence won’t move around due to its own vibrations. This soundbar from Pioneer will be a great fit for someone who loves to watch movies every weekend or hook up their Playstation or Xbox to TV and play games. It surely will make justice to all the Transformers and Avengers movies that are not only high on Visual FX but also on sound effects as well. For music, the SW-10 might be a little too dud, as it tends to add plenty of bass when not required. However nothing sort of a deal breaker too. 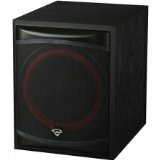 Cerwin Vega XLR-12S is probably the most funky-looking subwoofer under $500 due to the red accented ring around the woofer. Weighing at 48 lbs, this powered subwoofer from Cerwin Vega features a mind boggling 12-inch ‘Cast Frame High Excursion’ woofer inside. This subwoofer though priced close to $500, has the ability to pump out a total output of 250W, which is more than enough to fill out from a small dormitory room to a medium sized living room. If you crave for a little more, you can splurge out another $100 and get Cerwin Vega XLS-15S, which is a super massive subwoofer because it contains 15-inch woofer inside. The Cerwin Vega XLS-12S has a very low frequency response between 28Hz-150Hz that gives a great punch to bass and add sparkle to the overall sound. It has a front-firing woofer and do make sure you have enough space around, because it has a depth of 20.5-inch and height of 18.2-inch along with a width of 13.8-inch, hence this one is going to ask for a lot of real estate space. Talking about its design, this home theatre subwoofer under $500 has a nice satin black wood finish with a very strong construction using MDF wood and a black metal grille at front along with red ring on woofer to complete the design package. Though few people have reported that the amplifier inside the subwoofer isn’t as good, however I happen to disagree and with my listening I know it’s strong enough to offer punchy bass even at high volume without distortion. No doubt that this home subwoofer is great for watching movies, but when it comes to RPG and War based games, this is where the XLS-12S shows its mettle, as it tends to rattle the entire floor and surrounding due to it’s deep bass. This is another 400W subwoofer in our list that costs just under $400 and happens to have a very large 12” driver inside. …however I’m not a big fan of their design. I’ve included one of their products here but I’m still not sold on their design. Launched way back in 2012, the SVS SB12-ND is still a popular and favorite subwoofer among masses and that can be easily seen by the star ratings on its product page. 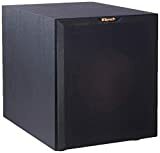 Coming with a Black Ash design on its wooden box, the brand takes real pride in notifying the user that this powerful subwoofer comes in a 14-inch wooden box and weighs only 35 pounds, while still containing a very large 12-inch subwoofer inside. Inside the cabinet, there’s also a Sledge STA-400D amplifier that offers 400W output and requires very less power even on standby. As compact as it is, the SB12-ND is the smallest subwoofer from the company and is surely available at an affordable price, considering the brand’s other products as well. Though I’m not sold on the inclusion of metal grille at the front, as at times it may distort the sound rather than improving it, a fabric grille could have been a good fit. However the metal grille does a good job in keeping the entire package premium and you can remove the grille and enjoy a pure obstrution free sound. The SVS SB12-ND will match up to be a great subwoofer for dorm rooms and from small to moderate-sized apartments as well. Since it has a very compact design, finding a place to keep this subwoofer won’t be an issue either. This Best Powered Subwoofer from Yamaha is probably the most stylish and best-looking subwoofer in our list of best subwoofer under $500. With it’s curved edges and piano black finish, the subwoofer will surely match to your premium interiors and does give a feel of being costlier than it really is. Weighing at around 40 lbs, it’s surely one of the lightest subwoofer in our list that contains a 10-inch front firing woofer inside. It won’t be an understatement if I say that the Yamaha NS-SW300PN is a subwoofer for the masses due to its easy-to-use controls and modern design. At the top front of the subwoofer, you get a power button and volume button, which are inclined at 45-degree angle for ease-of-use. The subwoofer being compact in size at (LxWxD) 13” x 14” x 16” has a surprisingly low frequency response between 20Hz – 160Hz for a deep and low bass. Even due to its deep bass, the subwoofer is incredibly tight in bass response, which makes listening music on it a joy, because to be honest, a lot of bass in songs; damages the whole essence of the song itself. No doubt you will enjoy it while watching movies and playing games, and while hosting a party, this subwoofer will be a room rattler. The 10-inch woofer inside is capable of offering a power output of 250W and is surely enough for consumer looking for sub that will quench their thirst for bass in a medium sized room. Yamaha also emphasizes on the fact that the NS-SW300PN comes with the brand’s own Advance YST II technology that offers distortion free sound even at high volume and Twisted Flare Port that reduces air turbulence for a tight frequency response. With the front grille off, the Klipsch R-12SW subwoofer looks as premium as any subwoofer can get for a price under $500. It’s Copper-colored Injection Moulded Graphite Woofer gives a total different look compared to other subwoofer unit that have either a black or dark grey colored woofer. JFYI, the Klipsch R-12SW, for a $100 extra comes with wireless connectivity, while the wired version is pretty much under $500. Technical specifications wise, this best budget subwoofer for home use features a significantly large 12-inch driver that is capable of producing total power output of 400W. It features an all-digital amplifier that powers this beast of a subwoofer and ensures reference-grade critical bass response, which is as expected from any Klipsch audio equipment. The 12-inch subwoofer sits inside a wooden cabinet with dimensions of (LxWxD) 16” x 14” x 18.5”, which is quite portable for such a big woofer and also makes it the lightest subwoofer in the list with weight of just 33 pounds. As I had said earlier, it’s easy to find a subwoofer that can offer deep and thumping bass, but the real trick is in finding a subwoofer that can offer a controlled; deep and thumbing bass without overpowering other frequencies and should be tight as well. And guess what… Klipsch R-12SW is the kind of subwoofer I was talking about. What makes things more interesting is that this subwoofer has a very low frequency response between 29Hz-120Hz and the brand offers 5 Years warranty on the woofer and 2 Years on the amplifier, hence you’re covered for any unfortunate circumstances. There’s no denying, this speaker would be a great companion for listening all kind and genres of music from rock, classical, pop to downright hip hop and trance, however it will also make a good companion to alongside gaming consoles like Xbox and Playstation as well. I hope you liked the article and it was able to answer you question about the best subwoofer under $500 that will be a total bang for your buck. If you have any questions related to the mentioned subwoofers, don’t hesitate to leave a comment below in the comment section. Incase you do like the article, I request you to please consider sharing it with your friends and family on social media platforms like Google+, Twitter and Facebook as well. If you have any suggestions, you can still make full use of the comment section as well.